Former Marine hospital was purchased by the museum in 2011. 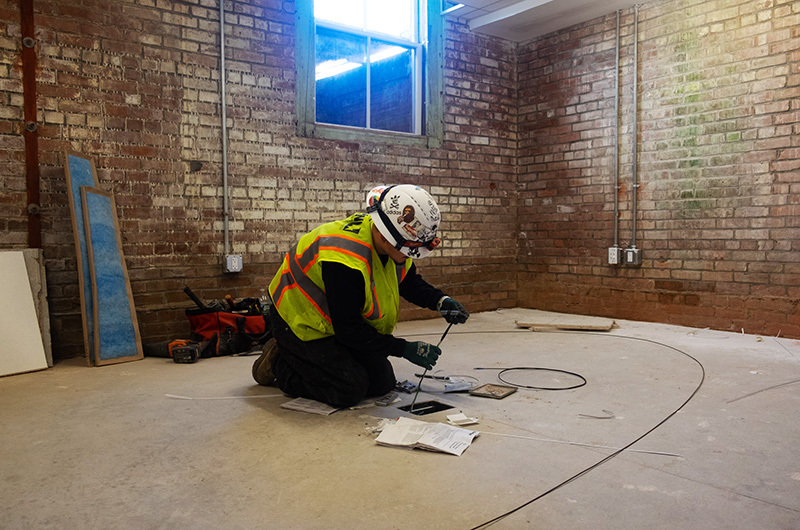 The $31 million restoration project has involved 20 contracting companies and 60 daily movers. The Martha’s Vineyard Museum, like anyone in the midst of a big move, has spent the last three months living out of boxes. The only difference is that they have about 17,000 of them. Since general contractor Consigli broke ground on the former 29-room former Marine Hospital in December, over 20 contracting companies and 60 daily workers have labored through northeast storms, ferry closures, heavy winds, heavier rains, and hard deadlines to turn the once-decrepit hospital and summer camp into a state-of-the-art museum. That museum was a far-off dream when they purchased the property in 2011. Now the $31 million restoration project is weeks away from becoming a reality. Meanwhile, the museum’s old campus in Edgartown has closed up shop. 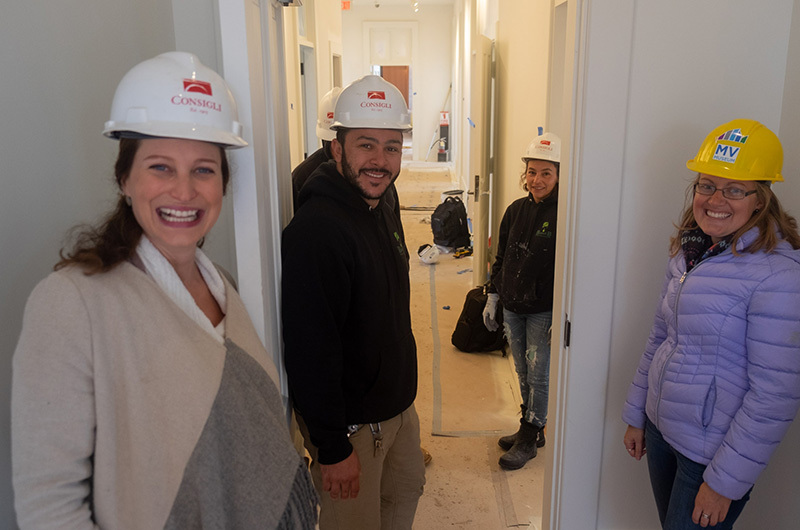 Many employees are now working out of a recently-purchased house on Skiff avenue, adjacent to the new building in Vineyard Haven. The rest are still packing up for the full move in November. 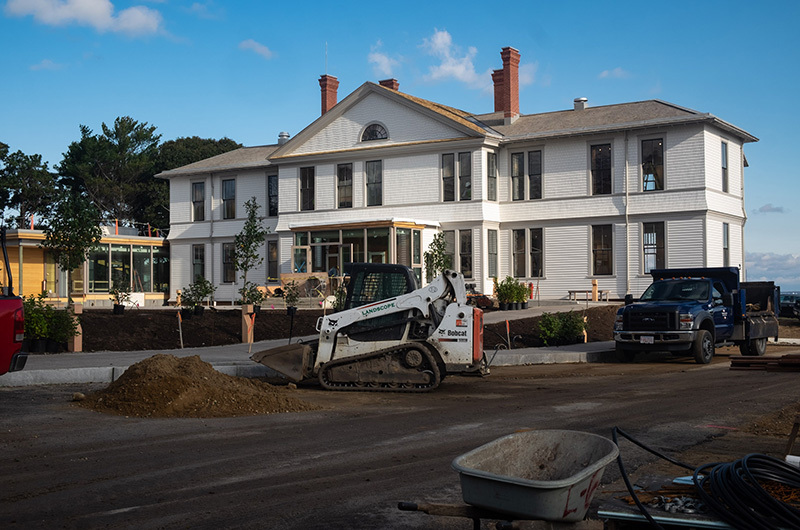 Although the museum plans to retain the front parcel of its Edgartown property with the Thomas Cooke House, they have put the former museum building on the market. Five years ago the building served as the Vineyard’s only year-round haunted house. Three months ago it looked like a construction company was preparing that haunted house for a particularly spooky October. But now that Halloween season has descended upon the Island and other buildings have draped their porches in cobwebs and critters, the museum has finally brushed off theirs, revealing the hospital’s fully-restored, and decidedly non-scary period facade. “It’s accurate to its original, 1895 appearance,” Ms. Fuller said. Wherever possible, the windows were restored with their 1895 glass, while floors, stairs, banisters and doorways were refinished without damaging the originals. The restoration even included a unique style of waved shingling within the building’s front gable. The museum opted for a pearly white color rather than the original forest green and mustard yellow trim. Inside the building, things are moving with rapid speed. Although some rooms still need cabinetry and millwork, most of the major construction is complete. 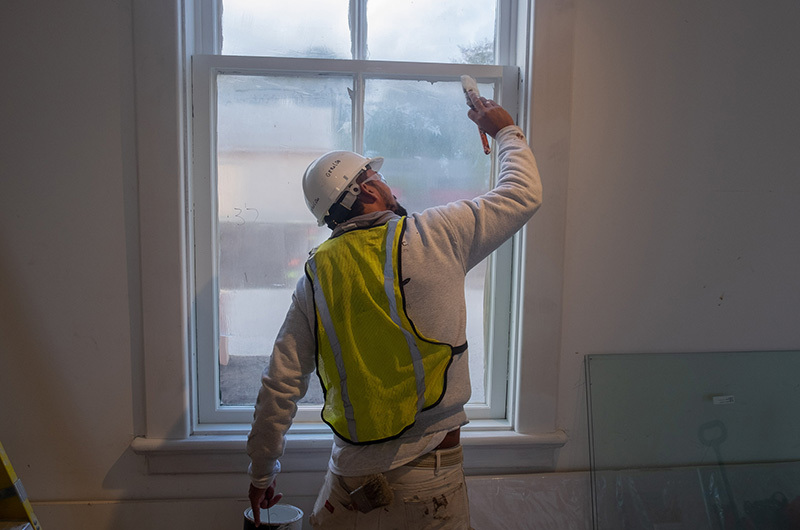 Contractors have even installed removable window shades that are pocked into the ceilings so that the museum can retain all of its 19th-century glass work without over-exposing objects to natural light. Along with the windows, the electric work is done, flooring is finished and drywall and plaster are worries of the past. Driving down Beach Road at night, the newly-installed lighting illuminates the building for all to see. And that’s not because the museum doesn’t read its electric bill. “I know, it’s bright. But we’re just following the law,” Ms. Fuller said. The law is an OSHA code that requires unoccupied buildings to keep lights on at night. Once the museum has a certificate of occupancy, the lights won’t be necessary. According to Ms. Fuller, that isn’t an all-too-distant future. She’s referring to the Fresnel lens, the historic mechanism originally used at the top of the Gay Head Light. The lens is currently in the hands of lampist Jim Woodard, an expert from Arizona who will restore the device. Although the museum has built a glass-walled pavilion that will house the lens, the logistics of maneuvering the massive object have proven challenging. “There are 1,008 glass prisms, all of which we have to protect,” Ms. Fuller said. 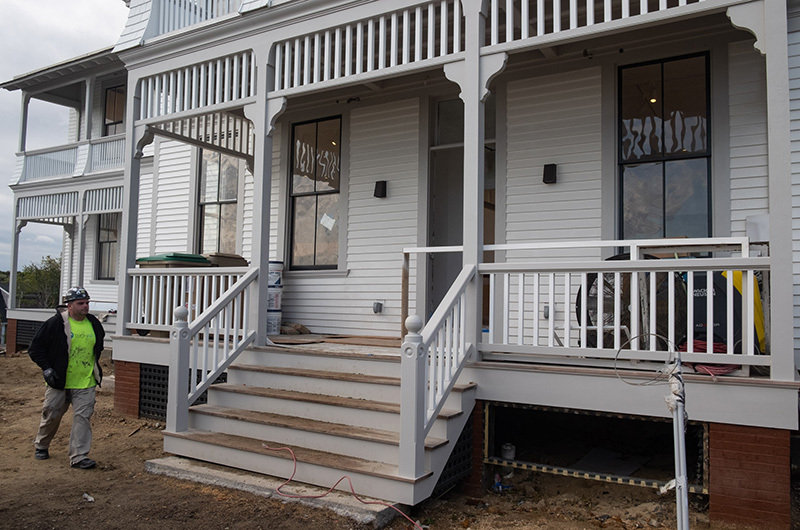 Mr. Woodward, will host a talk next Thursday at 6 p.m. at the Morgan Learning Center in Vineyard Haven about the restoration process. The pavilion will also include a year-round cafe, accessible without paying admission to the museum. Ms. Fuller was not prepared to reveal what business will provide the food service. “But I promise it’s Island people that everyone will recognize and know,” she said. The lens isn’t the only object the museum has had to move. Kathryn Brown, an employee of the consulting company Museum and Collector Resource and the move’s project manager, described working with Barnes Moving and Storage to transfer a collection that includes Thomas Hart Benton paintings, early daguerreotypes, colonial scrimshaw and the old Edgartown catboat Vanity. While Ms. Brown used Barnes and Prime Marina to transfer the museum’s historic whaling vessel, she has a special van for the collection’s more fragile objects. “The movers don’t have as delicate of a touch, so we’re going to move those,” Ms. Brown said. Ms. Brown, who had never been to Martha’s Vineyard before, relished the opportunity to work with the museum. While the old museum has sentimental value, most employees can’t wait for benefits of their new one. Back in Edgartown, the museum housed its larger objects in a cramped carriage shed. Now they’ll have an open-access space behind the main building for visitors to see an old lifeboat from the ferry Islander, a Noman’s island boat and a 19th-century racing whaler. Many of the larger objects will be placed on casters so the museum can rearrange the space for programming. 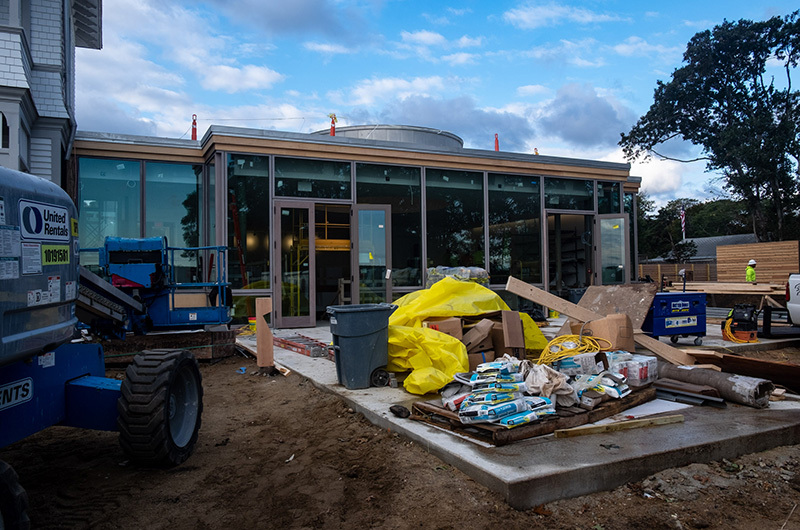 Other exhibits prepared for the soft-opening in December include a history of music on the Vineyard and a celebration of the 100th anniversary of the Migratory Bird Act. The new building will have parking, ADA accessibility, and one of the best views on the Island. 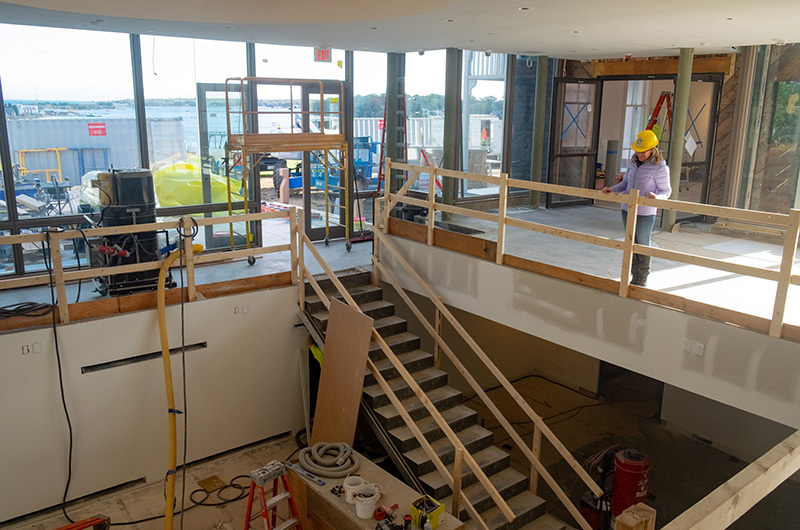 When the museum has its official opening next summer, the entire second floor will be devoted to Thomas Hart Benton. For Ms. Fuller, the day can’t come soon enough. At a minimum it will relieve her of almost a year’s worth of hard-hat hair. More images of the museum under construction. 31 million,and not one island company involved in this project,island museum?!! There are countless Island sub-contractors involved in this project. Keene Excavation has been involved since 2012. Landscope is doing all the landscaping. Seth Williams is the plumbing sub-contractor. Rick Convery's crew is doing all the painting. We could go on and on with a long list of Island trades. We insisted on it, and they have been doing fabulous work. The actual construction costs are about $18 million. The $31 million is the total comprehensive campaign including purchasing the property, endowment, etc. Vineyard has access to incredibly talented and creative contractors. Can't wait to see the museum when I return in August. Great job all ! Just drive by on any weekday and you’ll see islanders at work there. I enjoyed my visit to the under construction museum this past summer and am looking forward to seeing the completed museum next summer. I am also excited about the proposed exhibit 'Basketball as a Metaphor for Life: Vineyard Stories' that Richard Taylor, Flash Wiley, Duane Jackson and I are collaborating on with the museum. If all goes according to plan this exhibit will open in August 2019. 31 million for this? The funds could have been used for affordable housing, drug addiction, and so many others programs the island needs, you could go on and on But a museum really? Amazing job. Cultural institutions are important to a vibrant local and tourist community. I donated and will continue to do so. Bravo!